The family of a 23-year-old man found dead in his prison cell have cast doubt on the official account of his death. Marc Maltby became the fifth inmate to die at Nottingham Prison within a month on 12 October. His mother Sharon Whitford, from Newbold in Derbyshire, was told he damaged his cell and was later found with "ligature" marks around his neck. Nottinghamshire Police said it was not treating the death as suspicious at this stage. Mr Maltby was three weeks into a four-month sentence when he was found dead, Mrs Whitford said. She believes CCTV had been "deliberately" switched off so officers could deal with her son after he had begun smashing up his cell. The Ministry of Justice said CCTV was not live on four wings at the time for maintenance work, but it was now fully operational. A Prison Service spokesperson added: "HMP Nottingham is working closely with health colleagues to increase the support available to vulnerable prisoners and is increasing staffing levels which will boost safety and stability at the prison - an extra 40 prison officers have recently been recruited." Mrs Whitford has also raised questions about her son's injuries. "There was no ligature mark that we could even see on his body - the bruising was far too much, we have never seen so much bruising," she said. "It was from his chest, all up his neck to his hairline and he was literally blacky-blue." Brother Jordon Maltby, 24, who was himself in Nottingham Prison six months ago, said staffing levels were "bad" and young prison officers had little experience. "There are a lot of young lads with big egos going in there and doing things the wrong way and not taking responsibility," he said. Nottinghamshire Police said they were investigating on behalf of the coroner to determine the circumstances surrounding Mr Maltby's death. Inquests into three recent deaths at Nottingham Prison have been opened and adjourned. Another inquest is due to open on Thursday. 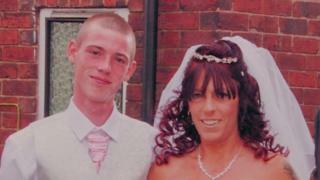 The deaths are also being investigated by the Prisons and Probation Ombudsman.